Olivier Giroud scored a sublime volley early in the first half to inspire Arsenal to victory over a courageous Crystal Palace; grabbing their first win of the season. Selhurst Park was evidently a fortress ahead of Crystal Palace's return, and they went in full of optimism after victory at Norwich, however Arsene Wenger's side were looking to bounce back from a shock defeat to West Ham on the opening weekend. The visitors made the much quicker start; pressing Palace back and on many occasions found themselves to be unlucky they never took an early lead. Ramsey sets himself for a neat lay off across goal, but Palace goalkeeper McCarthy charged out to close him down. With the shot-stopper off his line, Ramsey executed a short cut-back to Giroud who rifled a strike at goal only to be fantastically denied by Dann; sliding forward to block the shot. Moments later, Palace found themselves in deep trouble again. Some excellent, slick passing exchanges between Cazorla and Ozil put Sanchez through one-on-one with McCarthy. The Chilean's effort pummeled against the Palace goalkeeper, but Sanchez's rebounded shot was then excellently denied off the line by McCarthy who somehow retained the initial stalemate. The first 15 minutes had been all Arsenal, and their hard work soon paid off thanks to Olivier Giroud. The short move started with Ozil, who wasn't picked up soon enough, he whipped in a high cross, even just about to the land behind his French teammate, but Giroud brilliantly turned his body, latched onto the ball and rifled an unstoppable volley into the top corner. Sublime strike, that of which McCarthy didn't stand a chance of saving. Despite conceding an early goal, losing out to tonnes of possession and just not really being able to assert themselves into the game, Palace marvelously struck level. Bolasie did well to chest down a cross under pressure to McArthur, who laid off Ward to lash home a blistering 25-yard strike into the bottom left hand corner. Excellent reply, from a game that had been one-sided. Wenger's men immediately looked to regain the lead, and almost did if it hadn't been for McCarthy. Ozil crossed in to the back post, and Ramsey did well to peel past his marker and unleash a shot at goal. The Palace goalkeeper stuck a vital left hand out to deny the Welshman. Both sides went into half time level, thanks to Joel Ward's blistering strike that cancelled out Olivier Giroud's 16th minute volley from close range. 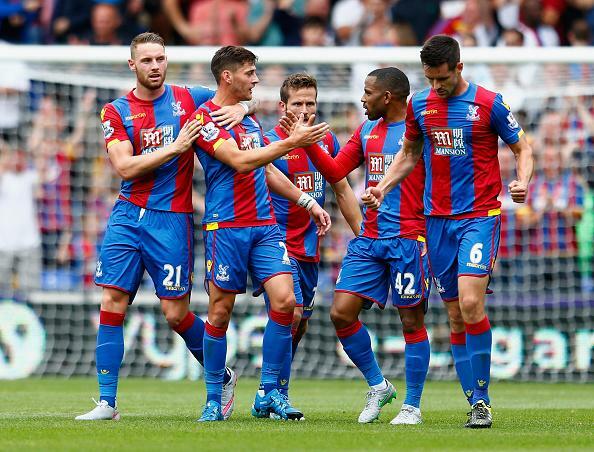 After the equalizing goal, Palace seemed a completely different side and they were oozing with confidence. Zaha scorched down the right wing, lashed a low cross into Wickham, who's marker Bellerin got on the wrong side of him, but the Englishman's shot agonizingly clipped Cech's left post and was eventually cleared out of danger. However, the match would swing into The Gunners' balance yet again. Bellerin whipped in a lovely cross, Sanchez leaped over Ward to lash a header down towards goal, but it was Damien Delaney who's right foot was in the wrong place at the wrong time and lashed into his own net. Terribly unlucky goal to concede. Puncheon was able to chest down a long ball, creep half-past Bellerin down the left and then unleash a shot at goal but it was a poor one and Cech saved with ease. As the game progressed, it became more apparent Arsenal were leaving Selhurt Park with their first victory of the season. In one of the very few late attacks Palace had, it was Cazorla who sniffed out Zaha's run. Arsenal would then pound forward looking for the all important goal that would certainly seal them three points. Ozil, on the edge of the area, lobbed over to Ramsey who took it on the volley first time but his shot blootered wide of goal. Despite hogging the ball, Palace were unable to create anything in the late stages. And anything they did create, Arsenal sniffed out with complete ease. One chance that Wenger's side couldn't prevent with ease: Souare's cross was chested down to Lee in the area by Wickham, but instead of lashing a left-footed strike at goal, the South Korean attempted a cutback onto his right side but Bellerin ensured he wouldn't offload a clean shot and cleanly dispossessed Lee for a corner. It was a corner that Palace failed to find an equalizer in, and marked Arsenal's first win of the Premier League season, also avoiding another disaster after the shock defeat to West Ham. Their campaign is underway, but Alan Pardew's men showed promise and will be a threat to all teams in the division. 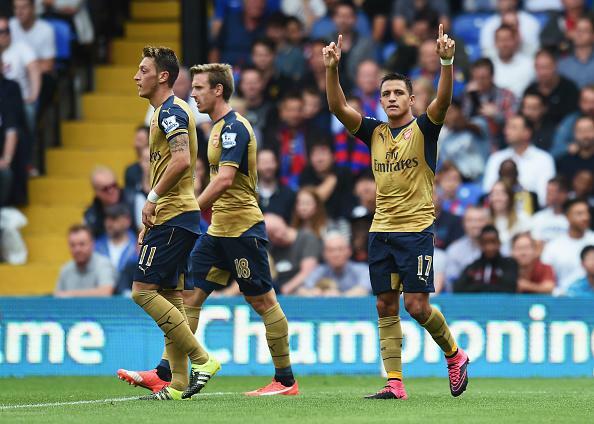 Olivier Giroud helps Arsenal take three points away to Crystal Palace.